Following the trend of Mac writing apps that offer uncluttered interfaces and a minimal number of features. Modern text editors are built on first impressions. Where the word processors of old inundated us with oodles of options that took months to master, today’s iOS-inspired versions dispense with the features and strip away the ribbons and bars to bring us the cleanest canvases imaginable. Lightweight and minimal, they do their best to emulate the classic pen-and-paper experience, removing nearly every bit of distractive clutter and noise to keep our eyes and brains focused on the task at hand. 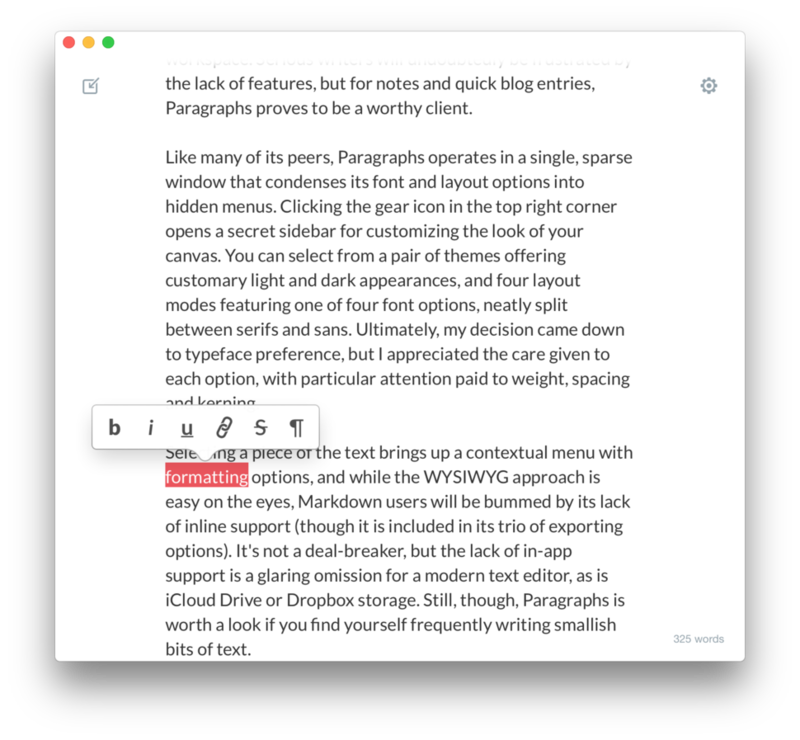 Paragraphs allows you to swtich between light and dark interfaces. 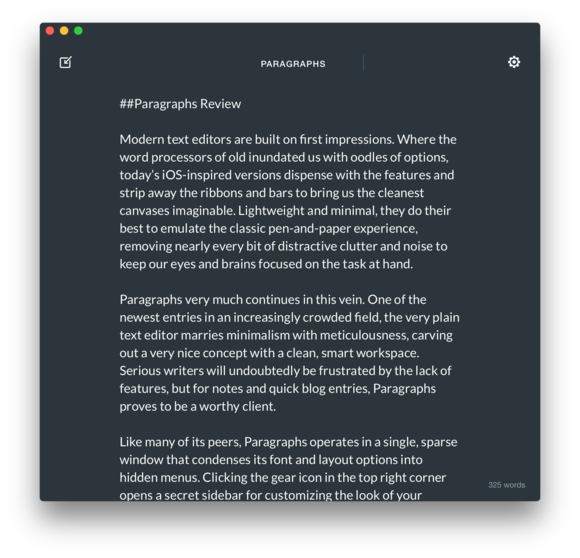 Paragraphs (Mac App Store link) very much continues in this vein. One of the newest entries in an increasingly crowded field, the very plain text editor marries minimalism with meticulousness, carving out a very nice concept built around a a clean, smart workspace. Serious writers will undoubtedly be frustrated by the lack of features, but for notes and short blog entries, Paragraphs proves to be a worthy client. Like many of its peers, Paragraphs operates in a single, sparse window that condenses its font and layout options into hidden menus. Clicking the gear icon in the top right corner opens a secret sidebar for customizing the look of your canvas. You can select from a pair of themes offering customary light and dark appearances, and four layout modes featuring one of four font options, split between serifs and sans. Ultimately, my decision came down to typeface preference, but I appreciated the care given to each option, with particular attention paid to weight, spacing and kerning. 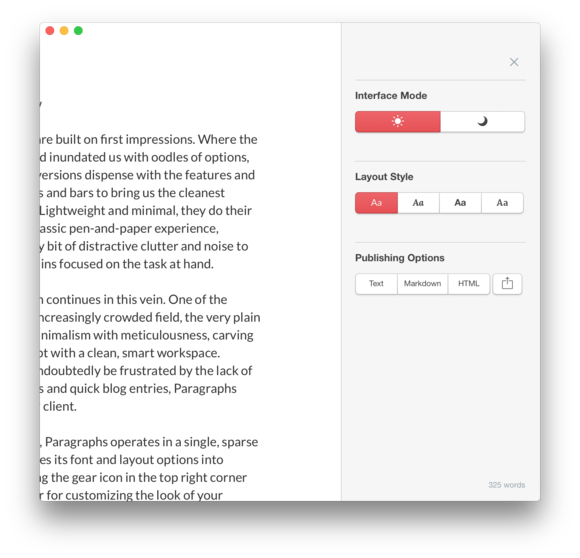 Click on a gear icon and a sidebar opens, allowing you to customize Paragraph's look. Selecting a piece of the text brings up a floating formatting menu, and while the WYSIWYG approach is easy on the eyes, Markdown users will be bummed by its lack of inline support (though it is included in its trio of exporting options). For most people it shouldn’t be a deal-breaker, but the lack of in-app support is a glaring omission for a modern text editor, as is iCloud Drive or Dropbox storage. In Paragraphs, a floating formatting menu appears when you select text. Paragraphs is worth a look if you find yourself frequently writing smallish bits of text. 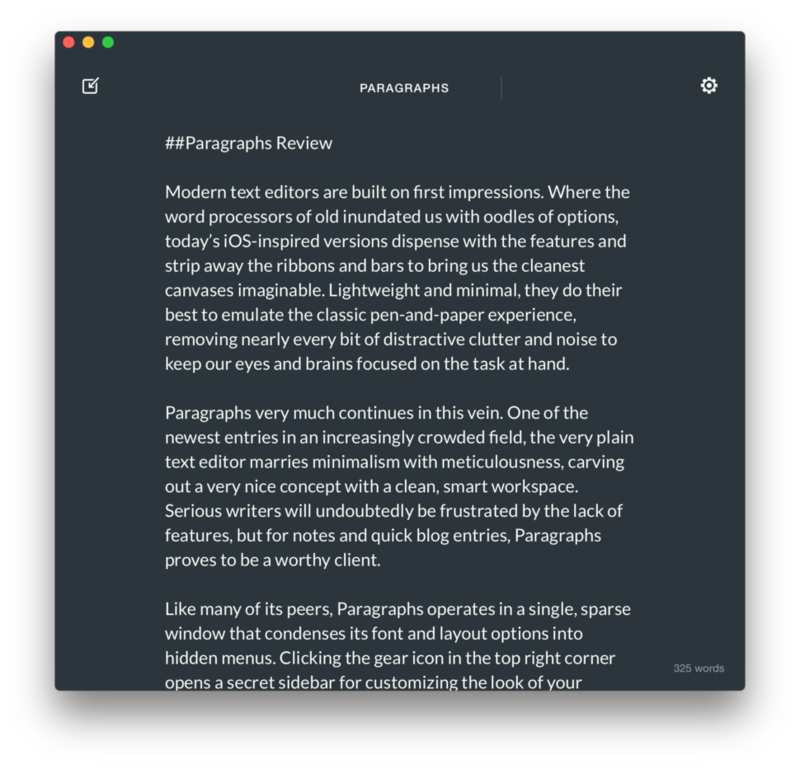 Paragraphs is yet another another minimal text editor, but it's a good one.